shopnewbalance.com: What are those 'bumpy' laces? What are those 'bumpy' laces? There is nothing worse than laces coming undone during a race. There are many types of laces out there that can help your shoes stayed tied tight. New Balance has a remedy for those annoying 'lace' mishaps, it's called Sure Lace™. 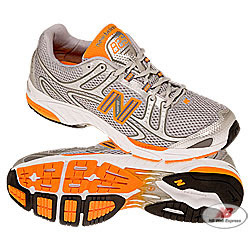 If any runners/readers out there own the New Balance 825s, you already own shoes with Sure Lace™. Best characterized with noticeable 'bumps' , Sure Lace™ laces are designed to keep your laces tied tight and secure no matter the distance or stride. Sure Lace™ is also perfect for variable lacing and fit techniques. So, these could be a good idea if you're trying out new options for lacing or new midfoot support ideas. I would recommend these laces for marathons or any long distance event; any race were lacing pit stops are not welcome!